When a classic movie fan hears the name "Topper" they can go in one of two directions. Either they instantly think of Roland Young beset by the ghostly George and Marion Kirby or they have the image of Hopalong Cassidy's white horse of that name and bad guys being chased through Lone Pine, California. Fond though I may be of the screwball comedy antics of ghosts, my first thought goes to the cinematic range. George "Gabby" Hayes (1885 - 1969) was a vaudeville veteran who was considering retiring when Wall Street laid that colossal egg and his wife and show business partner, Olive Ireland, suggested he cast his lot with Hollywood. 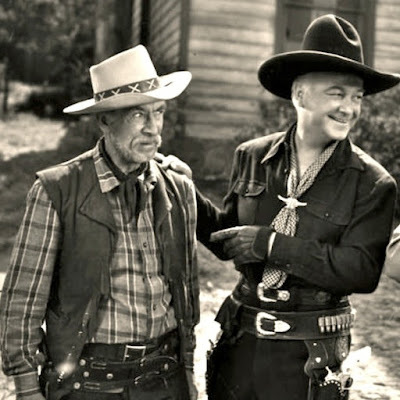 Talented character actors were in demand and George was kept busy in B pictures with occasional A parts coming his way such as the down-on-his-luck farmer who confronts Gary Cooper in Mr. Deeds Goes to Town. Seeing a niche for himself in B westerns, George learned to ride at the age of 50. In 1935 he played a sympathetic barkeep in the Hopalong Cassidy outing The Eagle's Brood, sporting a moustache and assaying a twangy way of speech that would soon become familiar to movie fans. That same year he sprouted whiskers and perfected his "durn tootin" persona in Bar 20 Rides Again. Windy Halliday had come to stay! A comic foil, the dupe of lovelorn ladies and teased by those young whippersnappers, Windy was also savvy and brave - a fellow you could trust in a tight spot. After 3 years and 23 pictures, Gabby parted ways with Windy when producers failed to appropriately acknowledge his popularity by increasing his bank statement. 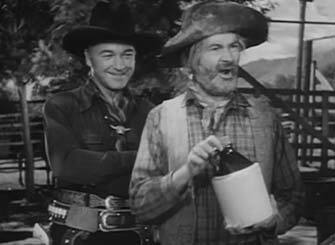 As "Gabby" the character remained the same and George backed up the likes of Roy Rogers, John Wayne and Randolph Scott. Mr. Hayes was inducted into the National Cowboy and Western Heritage Hall of Fame Museum in 2000. Next to Charlie Chaplin or Mickey Mouse can you think of a more recognizable film character staple? And the man was going to retire! Andy Clyde (1892 - 1967) was born in Scotland and was also a vaudeville veteran when he came to Hollywood and started working for Mack Sennett. He worked his way up from extra to a featured player and married one of the famous bathing beauties, Elsie Tarron. If this had been the sound era perhaps Andy would have become Hollywood's resident Scot, but with old age make-up, he created a successful curmudgeonly silent screen clown. Like Stan and Ollie, sound only added to Andy's comedy and bankability. For over 20 years starting in the 1930s he made comedy shorts for Columbia, mostly as "Andy Clyde" beset by sitcom plot difficulties. Mrs. Clyde was played by a favourite around these parts, Esther Howard. Andy joined the Hopalong team in 1940s Three Men from Texas, replacing Windy but not playing that role. California Carlson is as brave as his predecessor, but he's a little more gullible, apt to rush in where angels fear to tread, has a way with a double take that is sheer delight and a giggle that makes me grin. Scripts (38 of them, plus radio and television) provide ample opportunity for Andy to display his well-honed comic abilities. Andy Clyde became as familiar a face to television audiences as he was to movie-goers in programs such as The Real McCoys, Gunsmoke, The Andy Griffith Show and Lassie. A total of 373 movie and television credits from 1921 to 1966! I don't imagine Mr. Clyde ever considered retiring. Awesome blog, CW! Loved learning more about "Hoppy's Pals".